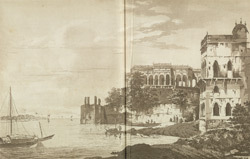 This is plate 7 from William Hodges' book 'Select Views in India'. This picture shows the riverside palace of Faiz Ali Shah at Ghazipur. Hodges went to Ghazipur in 1781 and saw this and many other buildings erected under Ali Shah's patronage. He had been chosen as governor of Ghazipur by Shuja ud-Daulah, the Nawab of Oudh from 1754 to 1775.